There comes a time after you’ve listened to enough music that the term “dissonance” has pretty much lost its meaning. 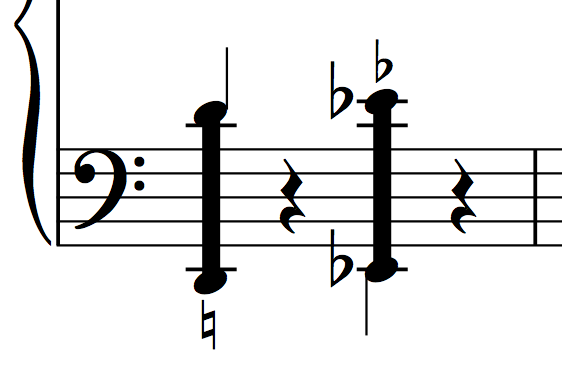 Technically it is defined as a combination of tones demanding resolution, or simply are inharmonious. But I’m aware of a great number of people who are under the impression that dissonance is beauty. By definition, that’s basically contradictory isn’t it? I mean there’s always underlying beauty in the eye of the beholder. However, I think it’s necessary for us to get the bigger picture. Throughout the Common Practice Period, there have been cycles of complexity and simplicity in art music. Nonetheless in general, since the beginning of our knowledge of music, the idiom has grown to produce some of the most complex – and very much dissonant – compositions to reach our ears, particularly in the last century. The ears of our generation have become accustomed to the extended chords of impressionistic music and the altered chords of jazz, which would naturally sound extremely dissonant to those living in centuries past. But in our time of living, composers have been putting together harmonies that are purposefully dissonant and stretch the limits of discord even further. Sure, stacked extended major chords produce clashing tones and suspensions that are extremely beautiful in resolution. Elaborate chromaticism in chord progressions can expound upon emotional tension and create even more wondrous results. Then we reach the concepts of modernism and the deliberate move away from tonality. Here there are things which take a trained ear and many compositions of which I am still not truly fond; pieces that are difficult to perform, direct, and listen to. The experimentation of sound lives on until this day, and while we are alive we will hear the best and the worst of these undertakings. I think it is safe to say that the focus of music in this century, backward from the CPP, is dissonance itself. It is also safe to say that great composers will not always resolve an ugly patch of pitches, and they want it that way. I’m not requesting that anyone realize this by seeking out modernism (although it would educate you), but be careful when you say that you enjoy hearing those delicious dissonances in an otherwise consonant piece, because you might end up discovering that all sorts of noise is considered music nowadays, and in this confusing world it can be difficult to call out the differences between what merits musical achievement and what just sounds repugnant.